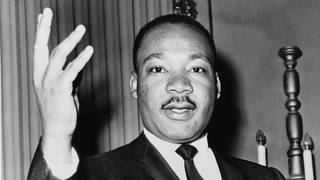 Dr. Martin Luther King, Jr and Singer Joan Baez in a Special On Civil Disobedience: Baez Recalls When King Visited Her in Prison, and We Play a Rare Recording of King’s Remarks | Democracy Now! A secret appeals court yesterday granted the Bush administration broad new powers to conduct wiretaps and surveillance of Americans and others suspected of being spies or terrorists in the United States. It was a major victory for Attorney General John Aschroft, who immediately announced the government will greatly expand the use of the special intelligence court to obtain more wiretaps of people suspected of involvement with terrorists. The New York Times reported on Sunday the Bush administration has begun to monitor thousands of Iraqi-Americans and Iraqi citizens in the US who are attending US universities or working at private corporations. In the event of a US invasion of Iraq, authorities will arrest and detain Iraqis or Iraq sympathizers if they are believed to be planning domestic terrorist operations. Brooklyn immigrants rights activist Bobby Khan says Pakistani immigrants are being arrested and deported at a rate of three per day. This is in the New York City area alone. Well today we thought we’d go back in time. Never before has it been so crucial to remember voices of dissent. We’re going to turn to the Reverend Dr. Martin Luther King, Jr. We’ll hear two little-known and hard to get speeches on civil disobedience. We start with an impromptu speech and press conference he gave outside the Santa Rita Rehabilitation Center in California. He traveled there to visit the famous singer and activist Joan Baez. Baez had been imprisoned for blocking the entrance to the Armed Forces Induction Center in Oakland. After spending over an hour with Baez, King came outside and was met by a couple of hundred supporters. A Pacifica radio journalist recorded his remarks, and we’re going to hear them in a few minutes. But first, we thought we’d talk to Joan Baez herself. We spoke with her yesterday and asked her to describe the day she was visited by Martin Luther King Jr. in prison. Rev. Dr. Martin Luther King, Jr., speaking to demonstrators outside the Santa Rita prison on January 14th, 1968.